Google(s goog), Apple(s aapl) and Samsung get all of the attention in the mobile patent wars, but it turns out only one of them is true powerhouse in terms of mobile intellectual property. Samsung and fellow handset maker Nokia(s nok) lead the overall mobile patent portfolio rankings, followed by infrastructure makers Ericsson(s eric) and Alcatel-Lucent(s alu) and software giant Microsoft(s msft), according to a new study from Chetan Sharma Consulting. Apple and Google, who have come to dominate the mobile landscape in recent years, don’t even make Sharma’s list, which is based on an analysis of 7 million patents granted by the U.S. Patent and Trademark Office and the European Patent Office over the last two decades. Only when Sharma breaks those patents into categories do Apple and Google make an appearance, showing up eighth and ninth respectively in the list of mobile platform patent strength. Their operating systems may dominate the smartphone market, but when it comes to the intellectual property behind smartphone operating systems, old school players like Samsung, Microsoft and IBM(s IBM) still rule. Nokia still anchors the list of patents related to making handsets and devices, while surprisingly Samsung is king in mobile network infrastructure. Commercially Samsung is relatively small player in the global 2G, 3G and LTE markets, but in terms of intellectual goods it still ranks ahead of Ericsson and Alcatel-Lucent, two of the industry’s biggest equipment makers, and even Qualcomm(s qcom), the inventor of the CDMA technologies that power most of globe’s mobile data networks. One item to note is that Motorola(s mmi) is strong in the device sphere, ranking fifth, which will give Google considerable patent heft in the smartphone arena once it closes its acquisition. 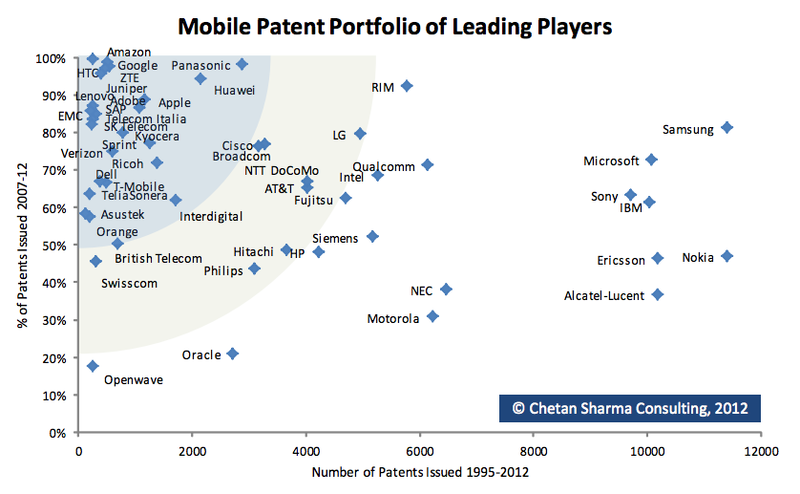 Sharma also points out that patent landscape is changing drastically just as the mobile industry is. Given the 20-year timeline of Sharma’s investigation, it makes sense that the long-established vendors have racked up the most intellectual property. Still in 2011, Samsung was still the biggest patent earner, and other entrenched vendors dominated the top ten. But as industry becomes data and application centric, patent activity has shifted from mobile’s traditional hotbed, Europe, to Silicon Valley, Sharma found. Google, Apple and Amazon may have only recently begun worshipping at the mobile altar, but in the last five years they’ve been plenty active in racking up their share of new patents.